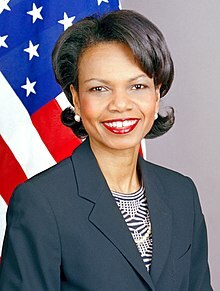 Place of Birth: Birmingham, Alabama, U.S.
Condoleezza Rice is an American diplomat and political scientist. She served as Provost of Stanford University, from 1993 to 1999, the 20th National Security Advisor, from January 20, 2001 to January 26, 2005, and the 66th United States Secretary of State, from January 26, 2005 to January 20, 2009. She is the first African-American woman, and the second African-American, to become Secretary of State (she was appointed by president George W. Bush). Condoleezza is the daughter of Angelena (Ray), a high school science, music, and oratory teacher, and John Wesley Rice, Jr., a Presbyterian minister. Her name, Condoleezza, derives from the music-related term “con dolcezza”, which in Italian means “with sweetness”. Condoleezza’s paternal grandfather was John Wesley Rice (the son of John Wesley Rice and Julia Head). Condoleezza’s grandfather John was born in Alabama. Julia was believed to be the daughter of Burr Woodward Head, a white plantation owner, who had English ancestry, and of his black slave. Condoleezza’s paternal grandmother was Theresa Hardnett (the daughter of Sylvester Hardnett and Cora). Theresa was born in Louisiana. Condoleezza’s maternal grandfather was Albert Robinson Ray III (the son of Albert Robinson Ray and Angeline Davie). Condoleezza’s grandfather Albert was born in Alabama. Condoleezza’s maternal grandmother was Mattie Lula Parham (the daughter of Walter Parham and Emma). Mattie was born in Alabama. I think it should be reported that she has stated in her autobiography to have Native American and Italian roots. Outdated cruft written before she appeared on Finding Your Roots and discovered her in-depth genealogy. The rest of her tales seems legit, considering the DNA Test. Why haven’t they banned you yet. How is this African and some English. Her DNA test states that she’s strongly European and a bit Asian as well. Her name, Condoleezza, derives from the music-related term “con dolcezza”, which in Italian means, “with sweetness”. That is because Condoleeza’s mother, Angelena Ray, was a high school science, music, and oratory teacher.